Due to the wide-ranging nature of the degree programme there is an immense variety of possible careers that students might be eligible for. Previous graduates on the related pharmaceutical science degree have found success in the following areas: analytical chemistry development, research and development in formulation, quality control, process development, research and development in cosmetics, clinical trials, clinical research associates, clinical trial project management, medical publishing, medical devices marketing, drug safety, production, accounts, pharmacovigilance, registration compliance, business development amongst many others. Students interested in careers in research and development have also pursued further study to PhD level. The Faculty of Science, Engineering and Computing has a specialist employability team. It provides friendly and high-quality careers and recruitment guidance, including advice and sessions on job-seeking skills such as CV preparation, application forms and interview techniques. Specific advice is also available for international students about the UK job market and employers' expectations and requirements. The team runs employer events throughout the year, including job fairs, key speakers from industry and interviews on campus. These events give you the opportunity to hear from, and network with, employers in an informal setting. 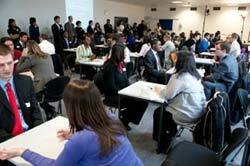 For example, in the picture here students are practising their interview skills with real employers at a 'speed interviewing' event on campus. In addition to building expertise in your own discipline, our courses will also help you to develop key transferable skills that you'll need for professional life or further study once you graduate. internship opportunities within and outside the University. In your final year, you'll get the opportunity to complete a major 'capstone' project where you can apply the knowledge and skills you have acquired to a range of real issues in different contexts. This is a great way to learn and is a valuable bridge to employment or further research at masters level.